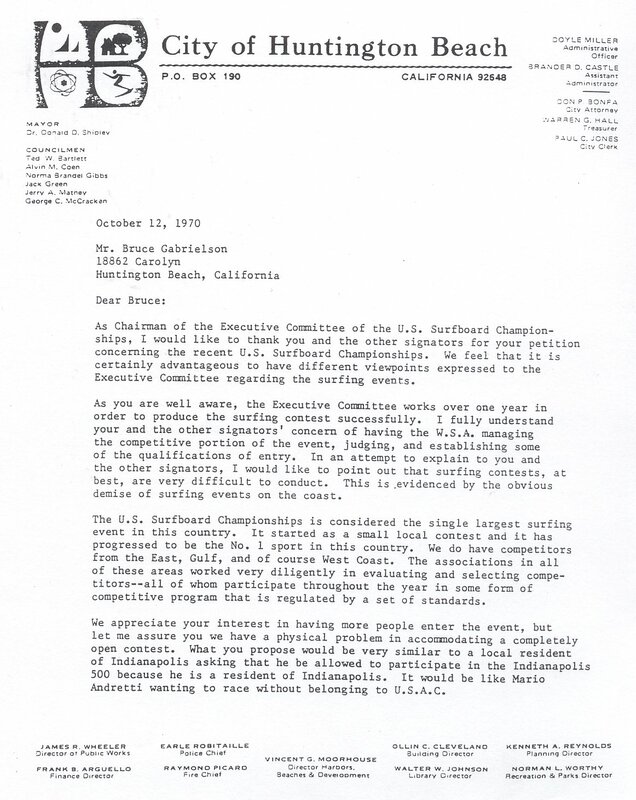 1970 US Surfboard Championships Controversy - Organized Surfing's "Declaration of Independence"
Organized Surfing's "Declaration of Independence"
This paper represents a special piece of history that might be of interest to surfing historians. It is interesting for two reasons: the signers of the protest letters represented a large number of the finest surfers of the time, and also because these surfers were able to organize and accomplish something that had never been done before. It is considered the "Declaration of Independence" for surfing since after this event the contest surfers themselves were granted a formalized direct voice in their own affairs. The results of the events also led to the founding of the Huntington Beach residents surfing championships. Since its inception, the US Surfboard Championships in Huntington Beach was tightly controlled and run initially by the City of Huntington Beach, and then by the US Surfing Association and the Western Surfing Association. Officers of the WSA and city administrators often set the criteria for participation without first assessing how the competitor's themselves might feel. To some degree, the City also forced its opinion on the surfing community. Such was the case for many years until the surfers united in a common voice and finally took action to force change. 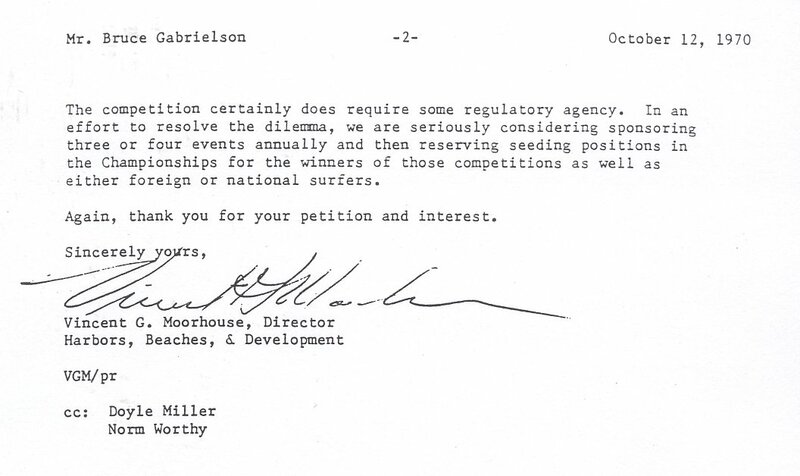 As a build-up to the controversy, Surfer West Coast Editor Barry Church wrote a story critical of the commercialization of the sport just after the 1969 US Championships. In the article he suggested that times were changing due to the way the surfers themselves were starting to organize and meet to discuss issues with how the sport was being run. He also set the stage by predicting what actually happened a year later at the championships. In 1970, a new rating system was employed by the Western Surfing Association that effectively prevented a large number of recognized surfers from entering the US Surfboard Championships. With so many good surfers left out, those of us who were allowed to enter decided to make our feelings known to the WSA and to those in charge of the event. As Huntington Beach Surfing Association President, I called a meeting during the contest, inviting both club members and guests. Here is an article from the Daily Pilot announcing the meeting. A tremendous number of competitors and active contest surfers showed up. At the meeting, I presented two protest letters to the audience, one for the Western Surfing Association (WSA) and one for the City of Huntington Beach. As you can tell by the wording and the number of signers, the petitions were widely received by many of the best competitors at the contest. A couple of weeks later, Vince Moorhouse sent me the city's response page 1 and page 2. While he tried to make light of the incident, just too many of surfing's top competitors wanted the change. The letter resulted in a shakeup of both the WSA and those who were responsible for running the contest. The protest led to the establishment of Huntington Beach's first local US Championships Qualifier held the following year and a revision of eligibility rules by WSA. I subsequently became the WSA's District 5 Director the following spring, and Contest Director for the 1971, 72, and 73 US Championships. I also was put on the committee that completely revised contest rules for the USSA. Here is a copy of the article in the LA Times about the first Huntington Beach Residents contest, dated Aug 20, 1971. Regarding the HB city contest, I worked with Norm Worthy, Recreation and Parks Director to get the contest approved. Basically, we supplied the equipment, judges and awards and Parks and Recreation would sanction it. Interestingly, to keep the operating budget low, I ordered a set of medals from House of Trophies in Costa Mesa. To my knowledge, medals haden't been given as surfing awards previously, and a medal supplier created a surfer for the medals that we could use. There exists no other single document or document sets from the early surfing world containing the number of notable signatures that these documents contain. This doesn't count the mural in the International Surfing Museum. I believe that this incident represented that very first time that a large body of the sport came together to force a change within the existing structure of surfing. The documents, now at the ISM in Huntington Beach, are a significant piece of history in the surfing world at large. As a final comment, Hoppy Swarts was a surfer as well as WSA Director. He was receptive to the feelings of the surfing community but his hands were tied. He was not the individual responsible for maintaining the status quo. There was a mind set among the entire community of Surfing's national organizations, local businesses and city administrators, not just in Huntington Beach but throughout the country that wasn't in step with how the competitors felt about their sport.